My apologies for missing last week's review! A special thank-you to Maddie for filling in. It looks like I'm jumping back in just in time because Blindspot is revving up its engines. Buckle up, friends and readers because things are about to get interesting. The singular theme to this week's episode was trust. Who can Jane trust? Can she trust the FBI? Can she trust Kurt? Can the FBI trust Jane? Can the team trust her? Can Kurt? The FBI, the team, Kurt and Jane are all separate entities. Trust between one does not necessarily necessitate trust between another. In "Eight Slim Grins," Blindspot began sorting out the players and whom can truly trust whom. The man from Jane's memories, the one who trained her, broke into her apartment. I looked up his name on IMDB and he's listed as "Ruggedly Handsome Man." No, that's not a joke and honestly I couldn't come up with anything better. So, Ruggedly Handsome Man it is. After some fierce hand-to-hand combat, he tells Jane that she cannot trust the FBI. Then, he's summarily shot by an unknown assassin. Goodbye Ruggedly Handsome Man, we barely knew you. See you in the flashbacks! The FBI is an extremely large institution, so Ruggedly Handsome Man's intel wasn't particularly helpful. He basically pointed at a haystack and said "happy hunting" to Jane. The search for the needle puts Jane on high alert and she begins to view everyone with suspicion. We, the audience, have a bit more information than Jane does at this point. We know Kurt's boss Bethany Mayfair is connected to the FBI file number tattooed on Jane –– a file number Patterson tracked down in the episode. Honestly, how long did Mayfair believe she could keep the redacted file a secret? The case file is tattooed on Jane's body, which automatically lends it to high visibility. It's surprising it took Patterson this long to figure it out. Did anyone else get nervous for Patterson when she handed Mayfair the file? Mayfair may not be interested in killing Jane, but her associate Thomas Carter (thanks, IMDB) certainly was. Since Patterson discovered the file it means she's now in the crosshairs as well. Gulp. Please don't kill Chrissy from Growing Pains because it's Chrissy from Growing Pains! Jane is right not to trust the FBI in its entirety, with Mayfair at the top of the list. Her continued refusal to share any information with Jane still lands her firmly in my "shady" column. Mayfair's reticence to kill Jane does put a plus in her column, however. (I may be grasping at straws, but strangely I like Mayfair.) Although Thomas Carter's relationship with the FBI is unknown, he's nothing but bad news. Jane needs to keep her head on a swivel when it comes to the FBI. We've surmised by now that Jane is right to be suspicious of the FBI, but not necessarily of the team. Mayfair and her shady intentions notwithstanding, Kurt, Tasha and Patterson are all firmly on Team Jane. They trust her and believe that she's an asset to the investigation. They really do want her on the team. Reade continues to be the lone wolf in questioning Jane's motivations. He's not entirely wrong to distrust Jane, but he goes too far when he wonders if she's amoral. Just because the Seals he's investigating tested amoral doesn't mean Jane is, too. They share a tattoo, after all, not a brain. Jane has: defended an abused wife, helped save a little girl, and put herself in harm's way to stop attacks countless times. I think we can safely rule out "amoral" from her character description. Dial it down a notch, Reade, sheesh. The end result is that Mayfair officially puts Jane on the team. It means Jane will finally carry a gun. Hallelujah! It's always nice and rare when logic wins in a television show. 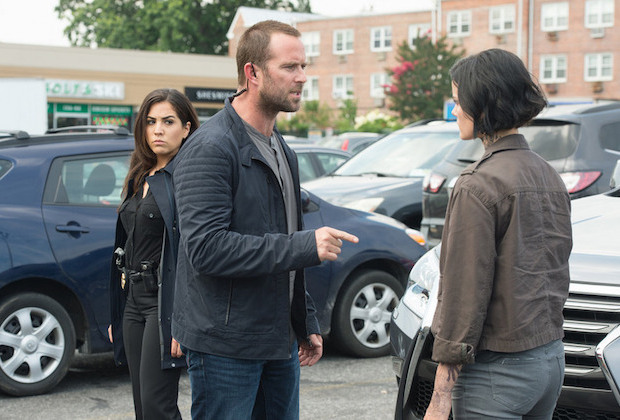 It also means that Blindspot can put an end to the ridiculous "stay in the car" arguments between Kurt and Jane. Of course, Jane has to pass a field exam before this all happens. Maybe the FBI should blindfold her so the field exam is actually challenging. Last week, when Kurt was explaining his theory that Jane is Taylor Shaw, I screamed: "Don't make them siblings!" First, a confession: I ship Kurt and Jane. The chemistry, the looks, the partnership and the pitch perfect "long-lost childhood sweethearts" storyline is too good for me to pass up. I'm on board with Team Jeller or Kane or whatever portmanteau actually wins on Tumblr and Twitter. So, obviously for this ship to sail, the show making the two siblings would be extremely inconvenient. Luckily, five seconds after this exchange took place, I did the math and realized that if Taylor was Kurt's sister, her last name would be Weller not Shaw. Bullet officially dodged in my book. I assumed Blindspot would drag this storyline out and lead us to believe Jane wasn't Taylor Shaw. Perhaps they would pull a DNA swap or something. Instead, Blindspot is hitting the ground running. Three DNA tests with three different samples all confirmed matches. Jane Doe is Taylor Shaw, Kurt's missing childhood neighbor. Could it be a ruse? Sure, but I doubt it. By answering the Taylor Shaw question sooner rather than later, Jane only becomes more mysterious and opens up more story opportunities. It gives both Kurt and Jane a foundation to start looking, which will move the story forward. It also means Blindspot isn't afraid to churn through story, which is a good sign. Jane (or do I call her Taylor now?) and Kurt spend a good deal of the episode fighting. Jane wasn't sure she could trust Kurt because he was obviously withholding information from her. Kurt wanted Jane to earn his trust, rather than expect him to hand it to her on a silver platter. The push/pull dynamic was interesting, especially during their fight after Jane chased down the Seal suspect. In the end, Jane and Kurt put suspicions and distrust aside. They tell one another everything. By doing so, they affirm that regardless of the madness surrounding them, they can trust one another. They can depend on one another. After Patterson informs Jane and Kurt that she is indeed Taylor Shaw, they grab hold of one another's arms. They weren't holding hands. The news stunned them both, as if the wind was knocked out of them. Jane and Kurt grab arms to steady themselves, as if they were one another's anchor. It'd be nifty if they stopped killing all of Jane's leads. Is there a reason Jane couldn't see a dentist? Woman lost a tooth. Give her some novocaine with that ice pack. Weller giving Jane his gun and telling her he'd get another one was extremely hot. Orion is terribly vague. This is worse than Alias. But despite the vagueness, "Orion" and "Daylight" do correlate. There are varying Orion myths in Greek mythology, but in most he is a hunter. His constellation is also one of the brightest in the sky. If Jane is associated with "Orion" and Mayfair and Carter are associated with "Daylight," those two images are diametrically opposed. The only thing that can obliterate the night is the day and vice versa. Yet, by associating the night sky with "Orion," the brightest constellation, it seems Blindspot is pointing to Jane as the hunter and "Daylight" as the hunted. Taylor Weller. Doesn't Jane's married name sound nice? Jeller or Kane or whatever we're calling this ship forever.